Without a serious set of physical controls, the smartphone isn't the natural habitat for the traditional platformer. Platform games are brilliant, beautiful, and frequently bonkers mutations of the games we used to play in the '80s and '90s. Part of that success is down to the way mobile developers have perfected those touch screen controls over the years. At other times, completely new movement systems have been introduced. Whether they're 2D, 3D, or something in between, there are some outstanding Android platformers, and we picked one of the best for you today. We’re introducing you a great platformer today, called JACK Adventure. This game is a 2D jump platformer that takes you on an infinite adventure full of dangerous enemies, many obstacles, and challenging missions. Take part in Jack’s journey and get as further as possible to win the highest scores and to become the ultimate winner in this game. Let’s talk about its gameplay some more! 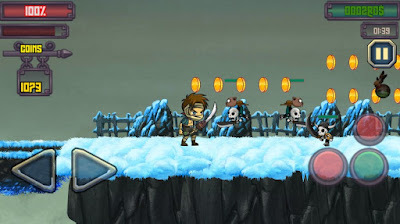 JACK Adventure has a unique gameplay that features a very cool character whose name is Jack. Jack is constantly wandering through forests, caves, snow and volcanoes because he is on a very important mission – he has to eliminate the evil powers and save the world of them. So, as a player, your main task is to help Jack fight these evil powers and overcome obstacle on his way. Just use the on-screen controls to go forward or backwards, to jump, run and fight when needed. There are multiple missions and levels that will challenge your gaming skills. In addition, collect energy drinks when you need healing and collect coins on your way to get high scores. The more you achieve and the further you get, the higher your scores will be. Do you have what it takes to fight the evil powers and to save the world? See for yourself, download the JACK Adventure platformer game for free from Google Play and enjoy hours of fun.